Hi, I am your go-to guy if you want to get things done in Vietnam. I prepare you to meet factories and introduce you to them. May I share what I know about sublimation printing in Vietnam with you? I love sublimation printing and know who does it well in Vietnam. Five years ago I considered to do it myself, learned about Mimaki's, Monti Antonio's and Ergosoft. I even travelled to China to source China's answer to digital printers and heat presses. I chose not to do dye sub in Vietnam but have kept my eye on all the suppliers like Transfertech and Aothun.vn. Are you looking for sublimation printing in Vietnam for apparel or home products like curtains and bed sheets? Do you need offset sublimation printing? You name it and if I don't know who's doing it, I will find them thanks to my network of printing insiders like Edgar from Nantex. Let's schedule s Skype chat and discuss the development of sublimation printing in Vietnam! Why did you search for sublimation printing in Vietnam? Are you looking for alternatives to your current supply chain? Or, are you starting up a clothing brand who's unique selling point is impeccable sublimation printing? Either way, I can assist you. Sublimation printing in Vietnam is not strong but I know who can do it well. I have produced dye sublimation garments myself using interlock fabric in Vietnam. 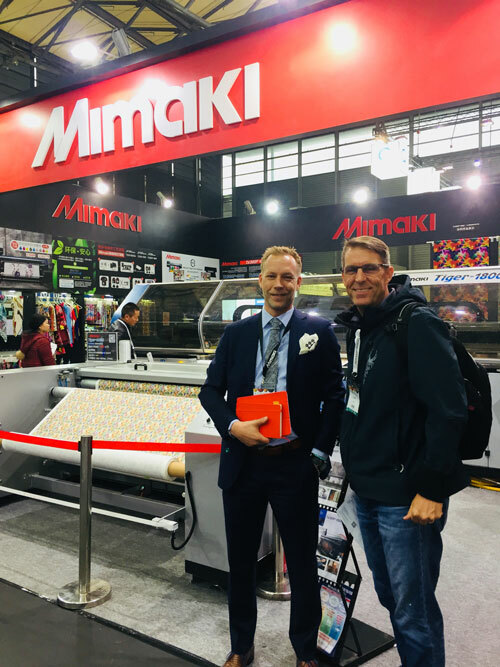 In the picture you can see me at a trade show with the head of sales at Mimaki which is a leading digital printer in Asia. Many of the sublimation printing happening in Vietnam uses Mimaki digital printers. There are two companies in Vietnam who use offset printing to print on transfer paper as opposed to using digital printers. Using the offset printing method requires the use of aluminums rollers that lead to high set up costs. Hence the offset printing method is only economical for high volume production; for example 10,000 pieces per design. 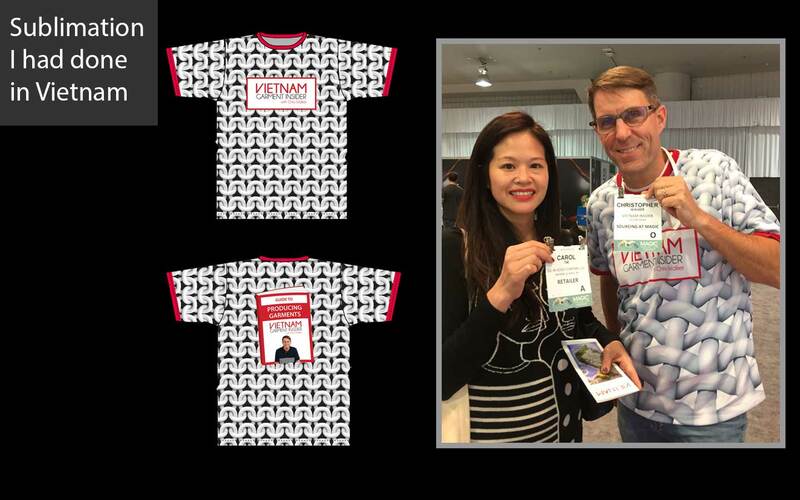 To better understand how sublimation printing in Ho Chi Minh city works its necessary to first become familiar with the key terms associated with the process. Working with anyone from a different culture that speaks a different language always has it's challenges. Sublimation printing is an alternate to screen-printing. You create an image on your computer and print it onto special transfer paper using sublimation inks. Then place the transfer paper and synthetic fabric into a heat press. The heat-press presses the transfer paper against the fabric at 230 degrees Celsius and causes the sublimation inks to “transfer” from the paper to the sythetic fibers i.e. polyester or nylon. After about a minute, the heat is removed and the transfer paper is peeled off, leaving behind a permanent, full colour image on the fabric. In summary, there are two steps to the sublimation printing: step 1 is using a digital printer to print your artwork on transfer paper, step 2 is to “heat press transfer” the design from transfer paper to fabric. Most companies in Vietnam use this method. Sublimation is the process of changing a solid particle directly into a gaseous state. The sublimation inks are heated rapidly such that they instantly expand into a gas state and easily penetrate the fibers of the yarn. This is why the dye sublimation printing has good color fastness properties. Are you interested to sublimate print on interlock fabric in Vietnam? If yes, contact me to execute an action plan. Polyester comes in many flavors. Each flavor has different properties and price points. Your first challenge will be dialing in the exact polyester fabric you want or accepting the fabric the factory offers you. Here is a quick primer about the different kinds of polyester yarns. You will hear the following terms with talking about polyester fiber: POY, ITY, DTY or FDY. POY stands for Polyester partially oriented and it’s used for rugs and curtains. ITY stands for Interlock Twist Yarn. It is a method of putting a twist in yarn used for knit fabrics resulting in a more natural elasticity and a soft hand feel. DTY stands for draw texturized yarn and is manufactured by texturizing partially oriented yarn. DTY is commonly used for sportswear. FDY stands for fully drawn yarn and is used for home textiles. When you ask for a polyester fabric make sure you know what kind of polyester yarn you are asking for! I recommend ITY or DTY if you want a smooth hand feel.